Whether you're a builder, a homeowner or a renovator, you'll appreciate the care that goes into every Railmaster creation. Don't see what you are looking for? Just ask—we will source the material. Choose from standard styles and options we have available to view or create something unique to you. Stair configuration: straight, circular, bowed, flared, winder, landings. Tread style: open, closed or plank treads. See our Parts of a Stairway page for staircase terms. Newel post: style and size. Baluster or spindle: style and size. 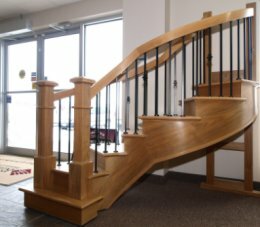 Railmaster can create your custom staircase from a wide range of materials; each one bringing its own unique character to your home. While traditional stair materials such as oak, maple or pine, compliment many of today's popular home designs, consider the wow factor of a cherry or walnut staircase. Jatoba wood anyone? This is an opportunity to add value to your home. From initial planning right through to final delivery and installation, our attention to detail makes the difference. Start with a set of plans, photos, and your ideas. Meet with one of our knowledgeable staff to select your styles, wood and finishes. We will prepare a quotation based on your plans and your selections. Stairs go in just before drywall. Railings go in before flooring. Wrought iron spindles or painted spindles go in separately from rail frame. Building code for wrought iron spindles is different for new homes and renovations. During installation, drywall may have to be removed, to prevent damage, from beside and under the stairs if this area is finished. Once framing is ready we will come to the site and perform a physical measure. 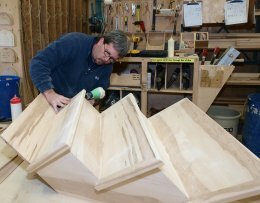 This measure ensures that the stairs we build fit your home, not an artist's concept. At this time we will need you to confirm the flooring that is being installed at top and bottom of stairs. Only after we have completed the physical measure, we will start building your staircase. Pine stairs (for carpeted stairs) take approximately 2 weeks to build. Hardwood stairs take approximately 3 weeks to build, dependant on availability of the material you select. Circular stairs can take longer depending on size and material. Time of year can also affect production time. 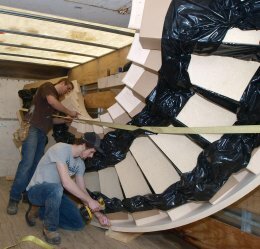 Our trained, professional stair installers will safely deliver and install your stairs. For additional information, see our FAQ - Frequently Asked Questions and Terms & Conditions pages. Before you begin your renovation, contact us to discuss your ideas. We can point out possible limitations due to space or building code requirements. Send pictures or plans if you have them; we can even come out to the site before you start, to guide you in the right direction. For multi-home builders, we provide high quality stairs, built to your specifications. Choose from delivery only or delivery and installation. We can provide volume drops to sites with specific instructions on proper install of our stairs. To start designing your perfect staircase, Contact Us today.